Lots of photos and not so much writing in this episode of our week in play. 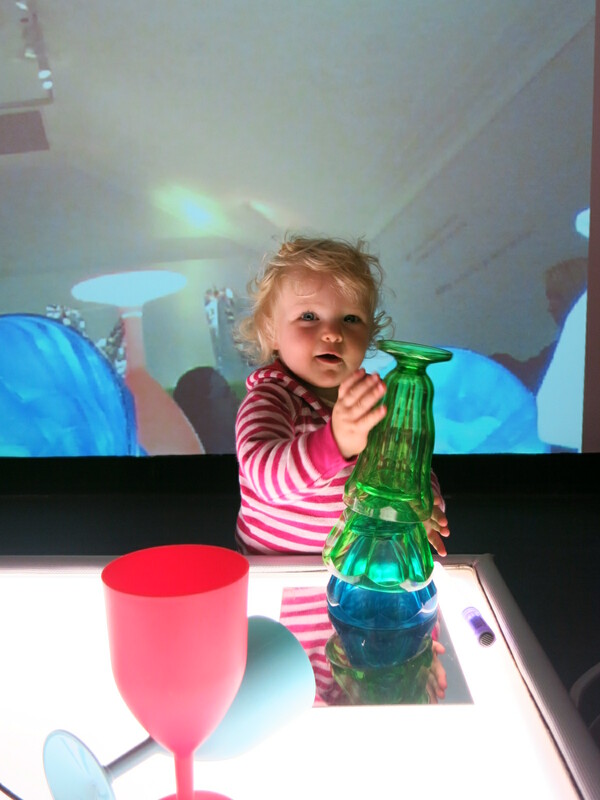 We were lucky enough to visit the Ipswich Art Gallery twice this week. There we discovered the Light and Play Exhibition as well as The Wonder of Learning: The Hundred Languages of Children exhibition which detailed the story of Loris Malaguzzi and how the aftermath of World War Two inspired his revolutionary approach to early childhood learning in the Northern Italian City of Reggio Emilia. Each of these exhibitions was so inspiring. 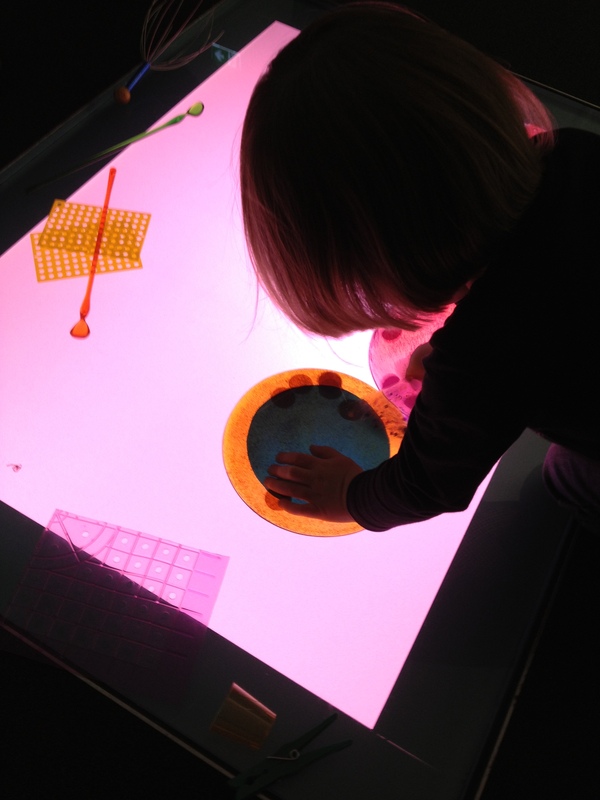 I got so much out of the Reggio Emilia exhibit and am now keen to learn a lot more. 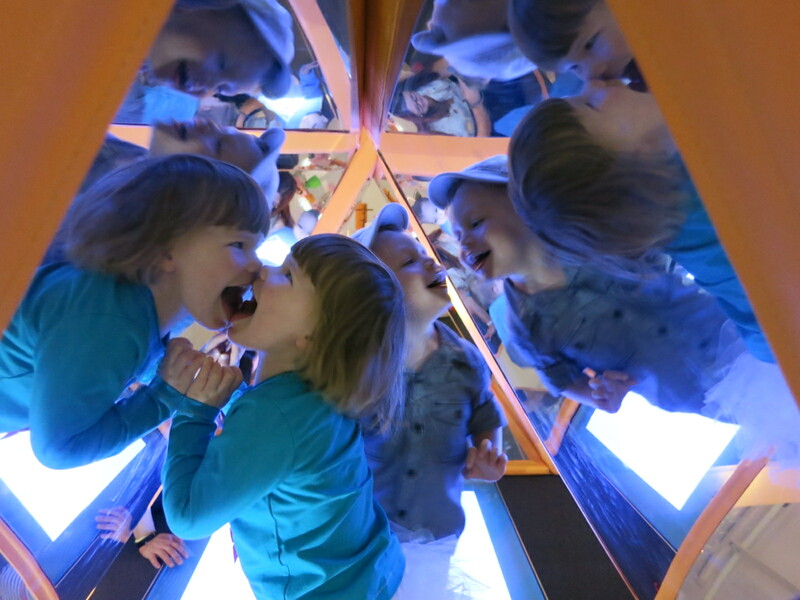 The Light and Play exhibition drew both girls in immediately and invited them to interact, explore and discover reflections, shadow, projection, magnification and a whole host of other dimensions of light physics. If you live in or around Brisbane I would highly recommend taking your children to see this display. It ends in a couple of weeks and is well worth the trip. Here are a few of the highlights plus a couple of extra things we did during the week. 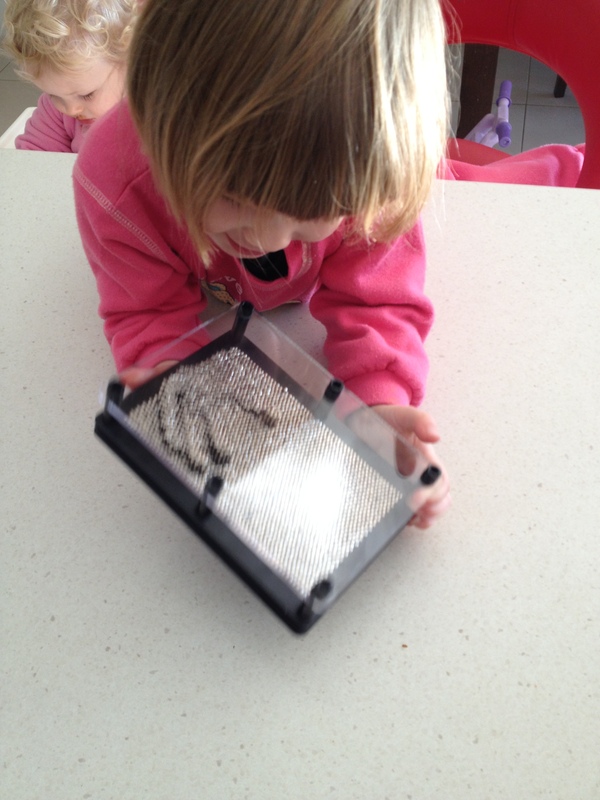 This light panel was built into the floor so it could be walked over, crawled over and fully explored. It changed colour every few minutes making all of the objects on top change appearance. This simple activity was quite inspired. It was a line strung between two points with pegs scattered along and a couple of baskets full of random objects nearby, ready to peg up. 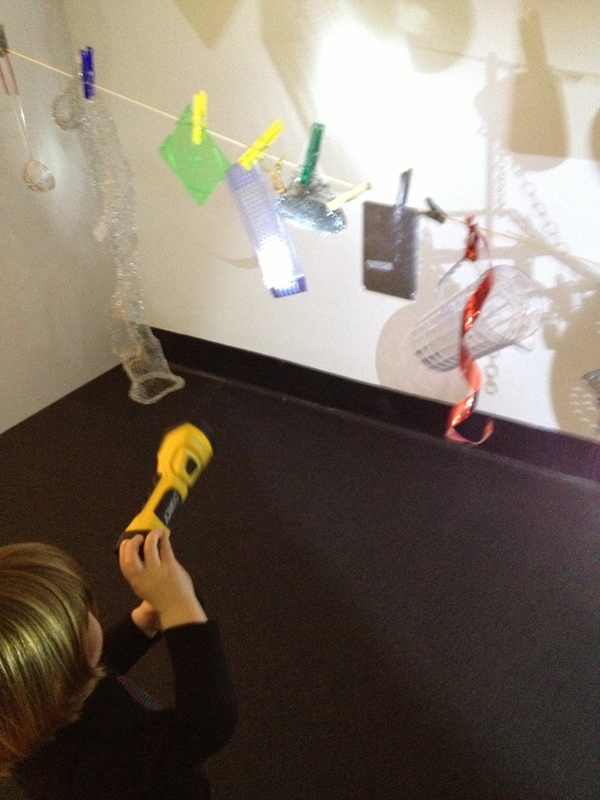 Children could then use torches to shine at the objects and watch as the shadows were cast on the walls. I am going to try to set something like this up at home this week because Lucy was really fascinated with the torch and loved making the shadows. 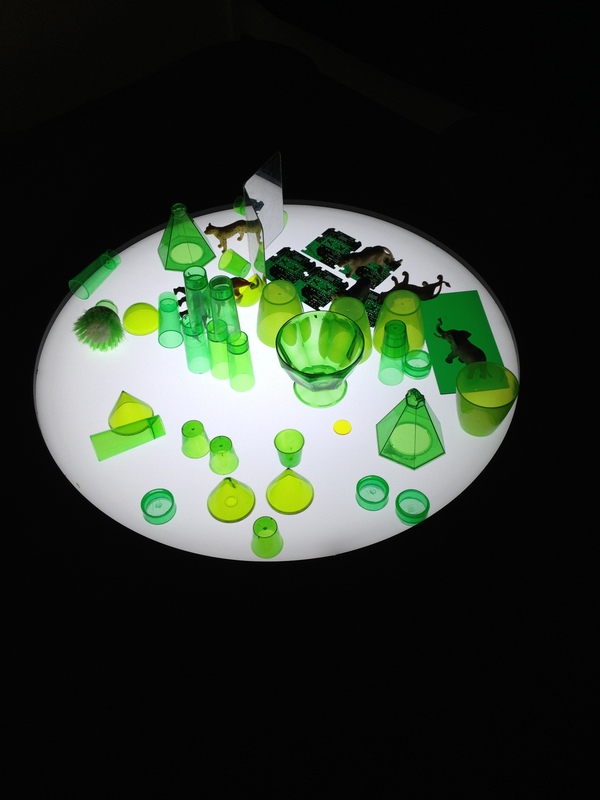 There were several raised tables with a selection of objects set aside in bins for the children to add and explore. 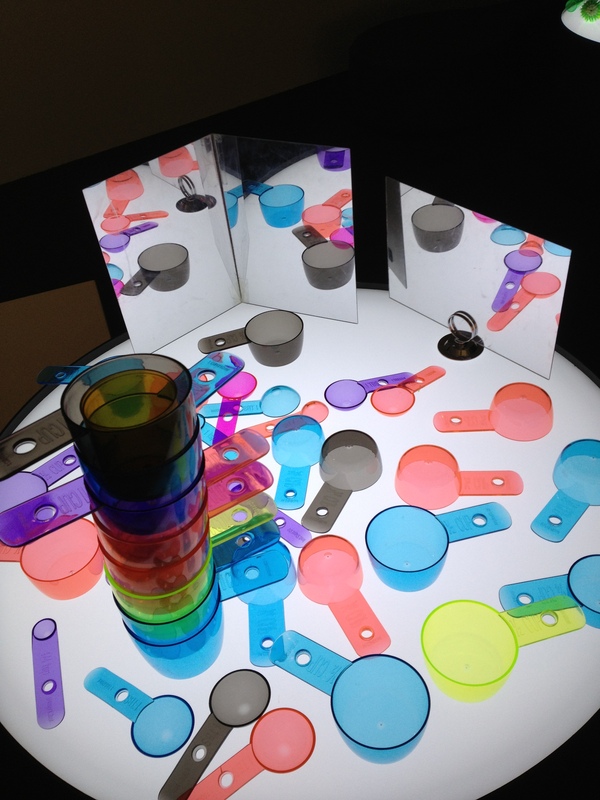 Another light table with mirrors to add a new dimension. 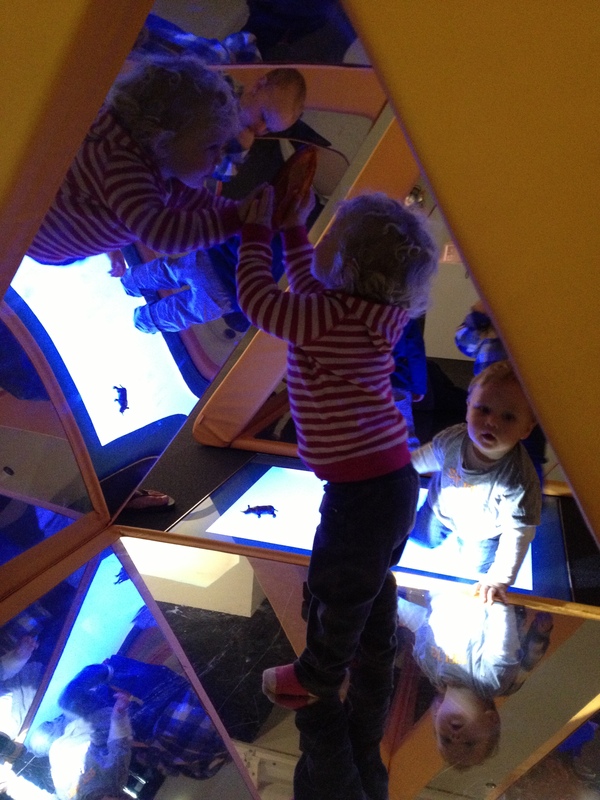 A little triangular house with Mirrors on each side kept Penny enthralled. And Lucy investigated with all senses!! 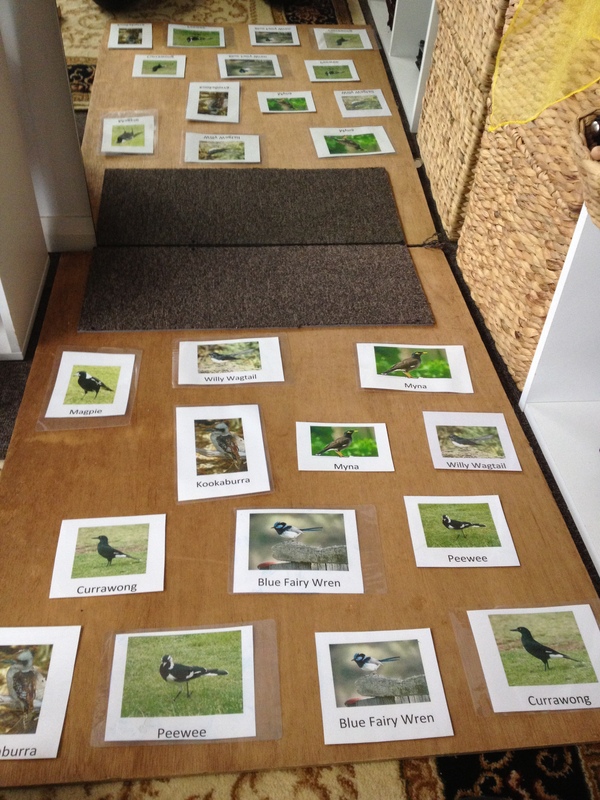 Back home and we continued to explore the local birds using these laminated cards. Lucy did some matching and recognition with this activity. Throughout the week she was able to identify and name many of our backyard birds. 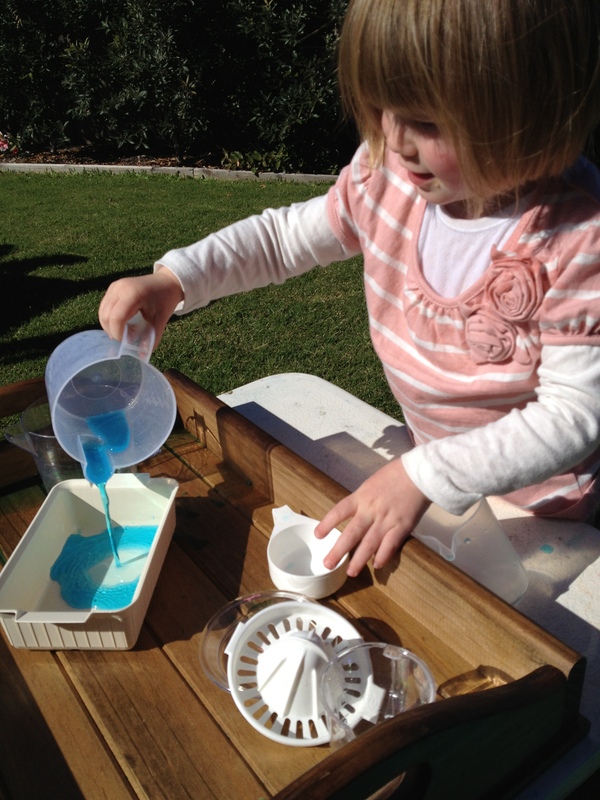 Pouring remained a favourite activity for Lucy as she got more adept at pouring from a variety of different containers. This souvenir from the art gallery was a huge hit. Lucy loved seeing shapes form in 3D and I am now thinking of some ways to incorporate this into an art invitation. Any ideas? So another week has past and for us it was one very much dominated by our gallery visits. I am going to leave you with a beautiful poem written by Loris Malaguzzi who has inspired thousands of people world wide to take the time to listen to our children’s need to play, to create, to investigate and to imagine. It is up to us to foster these inherent qualities in our children so that their inquiring minds blossom rather than shrivel. I truly hope that I can rise to the challenge set by Loris! The child is made of one hundred. The child has a hundred languages a hundred hands a hundred thoughts a hundred ways of thinking of playing, of speaking. Always a hundred ways of listening of marveling, of loving a hundred joys for singing and understanding a hundred worlds to discover a hundred worlds to invent a hundred worlds to dream. The child has a hundred languages (and a hundred hundred hundred more) but they steal ninety-nine. The school and the culture separate the head from the body. They tell the child: to think without hands to do without head to listen and not to speak to understand without joy to love and to marvel only at Easter and at Christmas. And thus they tell the child that the hundred is not there. The child says: No way. The hundred is there. 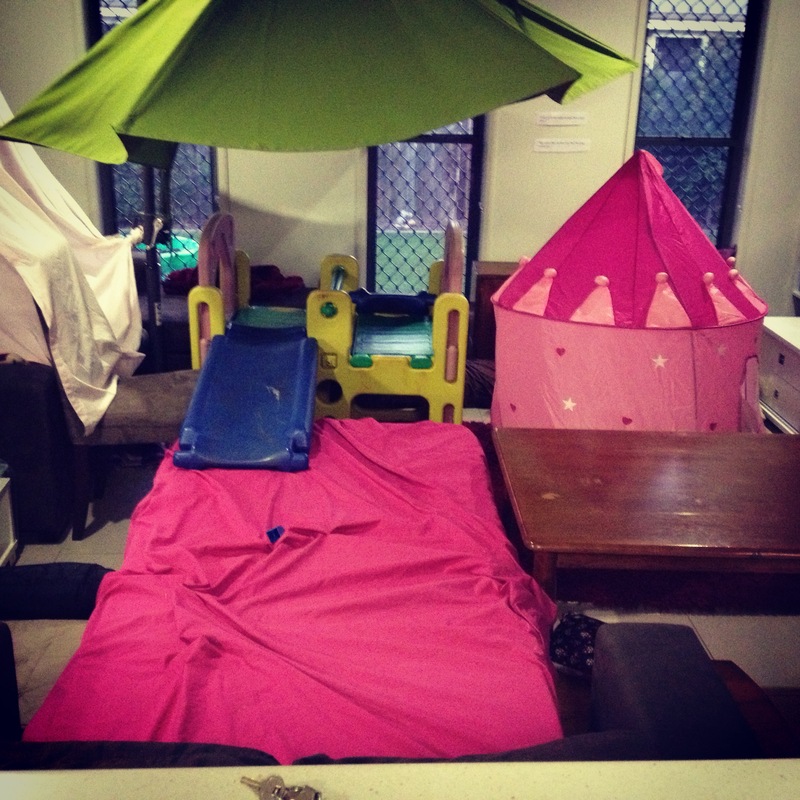 This entry was posted in Play and tagged allowing play at age and stage, confidence in children, Creativity, Imagination, Infant learning, Loris Malaguzzi, Open ended toys, Reggio Emilia Approach, Respectful Parenting, Toddler Play on August 9, 2013 by peacefulparentsconfidentkids. It looked like such an amazing exhibition. I know we would have loved it. The Hundred Languages of Children is so inspiring, isn’t it? It’s hard not to come away from it thinking in new ways. I love the little hand needle thingy (what’s that called? haha) I’m thinking about an art project….what about plaster of paris? I haven’t really tried it but it might work….or cloud dough makes some nice impressions which stick around for a while. Thanks, Kate, I hadn’t thought of plaster of paris. I’m guessing I could get some at Bunnings? You’ve def got me thinking. How do i make cloud dough? i think I’ve looked at making it in the past but it had something in it that I wasn’t sure of. I’m not sure what the pin thing is called either lol!